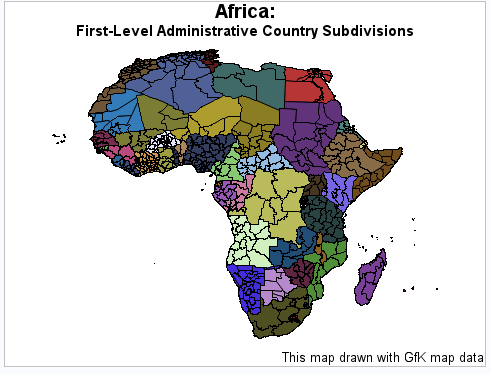 This example uses the first-level administrative detail in countries offering that detail in the GfK map data set to show the subdivisions within countries in the African continent. This level of detail is available only by country and not at a continent level with the traditional map data sets. Define the titles and footnote for the map. Change the color in some indistinguishable areas. Produce the choropleth map. The DISCRETE= option generates a separate color for each different response variable value. The NOLEGEND= option specifies that no legend statement is associated with the map. The STATISTIC= option specifies that the GMAP procedure will match the first observation from MAPSGFK.AFRICA1 data set and output the response value from this observation only.